Firefighter's Leather Sporran This sporran prominently displays your identity as a firefighter. This leather sporran is suitable for day wear. 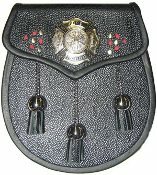 As an option, custom badges with your fire department or pipe band can be provided. Minimum quantities apply, contact us for details. Front: Black Grained Leather (Red Lined) Back: Black Grained Leather (Red Lined) Flap: CUSTOM Badge on Flap with Optional Color Accents Tassels: 3 Black Leather on Chain Strap: Black Leather Chain Strap Included.